Own a piece of Internet history. Make an offer for the domain and associated domains. The online community launched in 1998 and grew to global recognition in the web marketing and design industries until closing in May 2018. 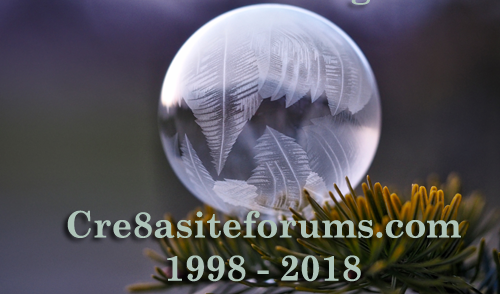 Well-known throughout the search engine marketing industry for nearly two decades, Cre8asiteforums ran from its earliest roots as a club in 1998 to its final closing as an online forums in May 2018. The domain is available for sale. The history of the community goes back to the pioneering days of website promotion, search engines and web design. Many leading CEO’s were once administrators or moderators, with several staff being hired by Google or enterprise marketing agencies through their exposure at Cre8asiteforums. Several domains are associated with Cre8asiteforums.com, including Cre8asite.net, which was a directory of content created from the community years ago but has since been disabled. The brand is an excellent opportunity for a website design or development agency seeking a creative name, with an outstanding reputation behind it. CASH/CHECK ONLY SALE – No Bitcoin – Certifications are paid by buyer. No exceptions. Price goes up if using a broker to cover their take. The .net and .org alternatives are also available. Cre8asite.net and Cre8asite.org are also for sale.